We just love Sherman already. He settled right into our home without a problem. The first couple of days that we went to work were a little hard on him. Sherman is a very sweet and well mannered dog. He is excellent on the leash. LOVES to go for walks. He does not jump up on strangers and hasreally buddied up to my friends 3 year old son, Ethan. The photo is attached. They are laying on the couch together. I cannot thank you and your efforts with CPR enough for such a great match.It feels great to know that there are folks out there like you and yourvolunteers that take the time out of your busy lives to help these poor animals out. We have told everyone who meets Sherman about CPR. 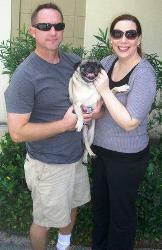 Hopefully his adorable charm will influence some new adoptive parents to a pug’s forever home.